"The Witches' Knot" is also known as the Magic Knot and the witch charm. It has become a symbol of protection against malevolent witchcraft. History tells us the witches used knotted cords to "tie up" the weather, to create circles of protection, and to bind things magically. 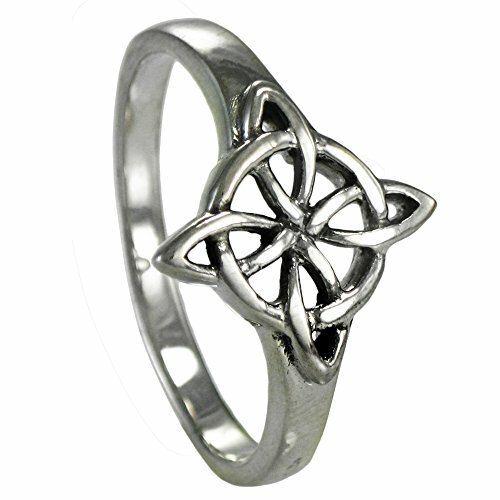 Our Witches' Knot design is made up of four inter-laced vesica piscis. The vesica piscis is a world-wide symbol for the yoni, the feminine creative force that gave birth to the universe. The interlacement represents the feminine control of the forces of nature. The circle is one of the primary female symbols representing the sacred or consecrated space. The spirals form the sign of the serpent. The serpent is the oldest symbol of female energy, the embodiment of enlightenment and wisdom. 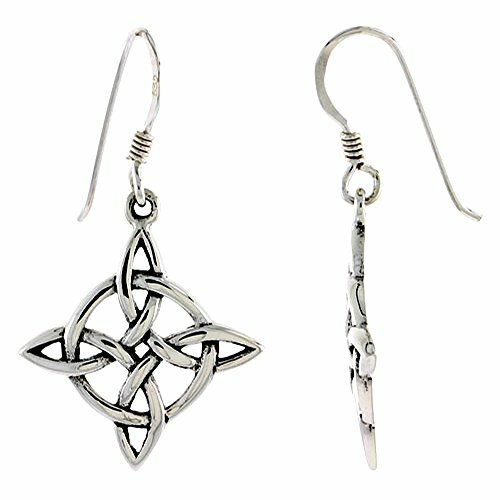 This combination of cogent symbols makes the "Witches' Knot" and awe-inspiring representation of female might and power! 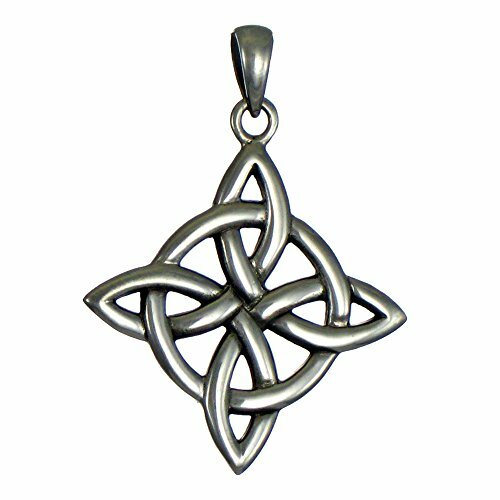 "The Witches' Knot" is also known as the Magic Knot and the witch charm. The Witches' Knot is made from the practitioner's sacred cord. It has become a symbol of protection against malevolent witchcraft. History tells us that witches used knotted cords to "tie up" the weather, to create circles of protection, and to bind things magically. 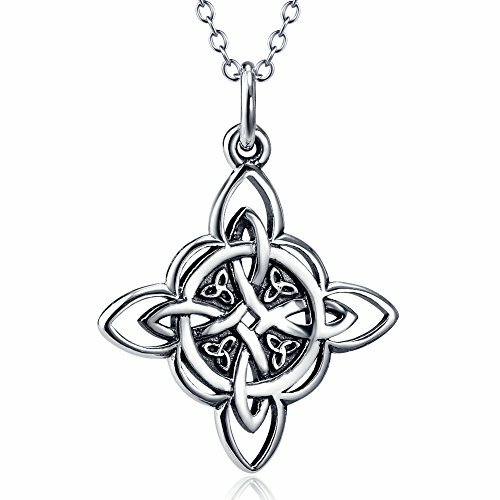 Furious Jewelry 925 Sterling Silver Celtic Triquetra Trinity Knot Good Luck Pendant Necklace, Rolo Chain 18"
Chuvora Sterling Silver Aqua Crystal Filigree Quaternary Mandala Witchknot Goddess Necklace 18"
This beautiful filigree necklace would be a wonderful addition to any wardrobe. 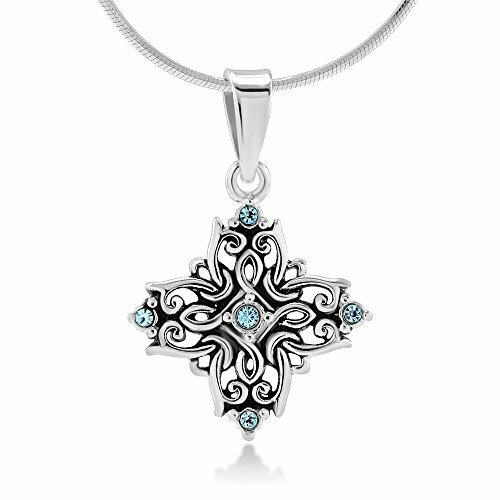 Made from 925 Sterling Silver certificied nickel free and Aqua Blue Crystal, stamped 925. Come with 18" Sterling Silver Snake Chain with Spring Ring Clasp. The included black velvet pouch makes it a perfect gift for any special occasion. About Chuvora JewelryChuvora Jewelry is a Mystic Clothing brand based in Palm Coast, Florida. Despite our rapid growth, we have remained loyal to our original hallmarks: Quality and value, ease of ordering, and integrity. GemstonesWhen present, gemstones may have been treated to enhance properties such as color and durability. See listing details for treatment disclosure information. Jewelry Care While Chuvora products are designed to last, proper care is an important part of keeping your jewelry looking it's best. Be sure not to wear your jewelry while cleaning or working with harsh chemicals, in pools or spas, or while playing sports. Store your jewelry individually to keep them from scratching each other. Store sterling silver jewelry with anti-tarnish strips to keep them looking their best. To clean your jewelry, use a warm, soapy water soak and a soft brush - especially when cleaning jewelry that contains gemstones. 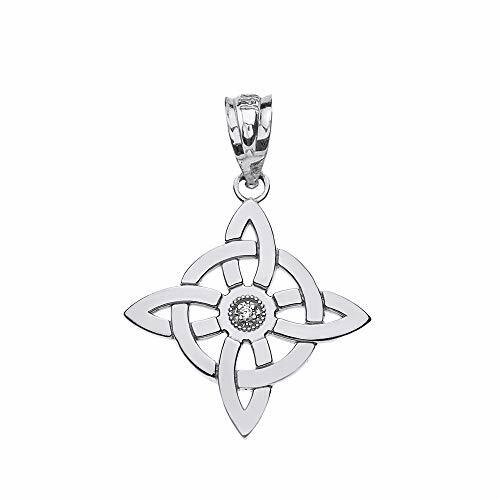 Wear this stunning 925 sterling silver witches knot wiccan pagan symbol necklace pendant to protect against evil and evil spells. The Witch's Knot is one of the most popular symbols in modern witchcraft Wiccan and Pagan practices. It is often associated with the feminine powers, and used as a symbol to protect against malefic witchcraft. In the past, witches used knots in magic to 'tie up' the weather, to bind things and to create magic circles. Necklace/Pendant Measurements Chain size 0.5 mm Pendant Height with Bail: 1.04" (26.416 mm) Pendant Height without Bail: 0.82" (20.828 mm) Pendant Width: 0.72" ( 18.288 mm) Pendant Depth (average): 0.07" (1.778 mm) Bail Fits up to a 3.5 mm chain Includes 1 cubic zirconia gemstone. These Earrings are crafted from Solid Sterling Silver and Oxidized to Highlight the details. The quality of these pieces of jewelry is outstanding and they are very reasonably-priced. The Interlaced Knot Pattern is so cool that they'll definitely make a brilliant, well thought-off gift for yourself or a loved one on any occasion. 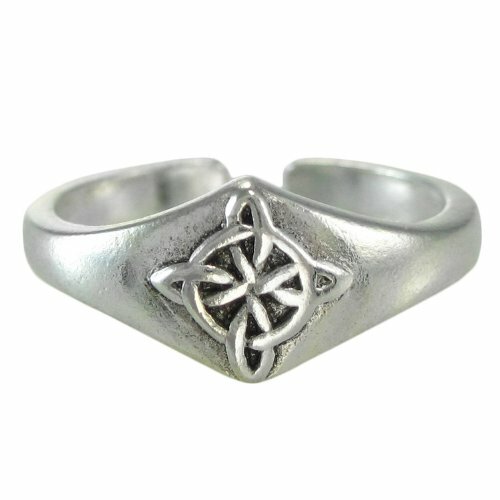 Our toe rings are made of solid sterling silver, and are adjustable one-size-fits-all. 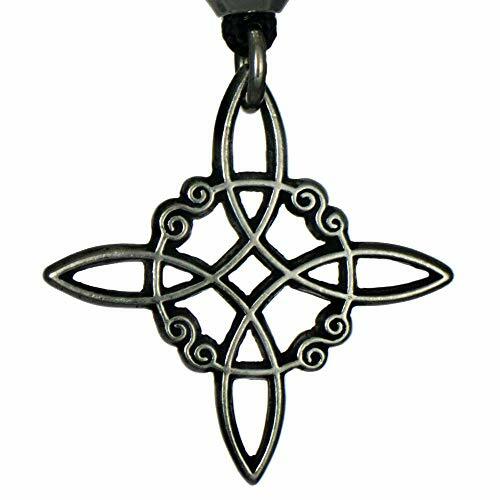 The four point knot, or Quaternary knot, is a traditional Celtic knot representing four fold concepts such as the four cardinal directions or the four earth elements. Want more Witches Knot similar ideas? Try to explore these searches: Athletic Print Hat, Large Digital Compass, and Beach Oil Painting.